We have a team building office in Seattle, Washington that is manned by our Portland-based instructors. As a result, all of our fun team building events are offered in Seattle and throughout the entire state of Washington. 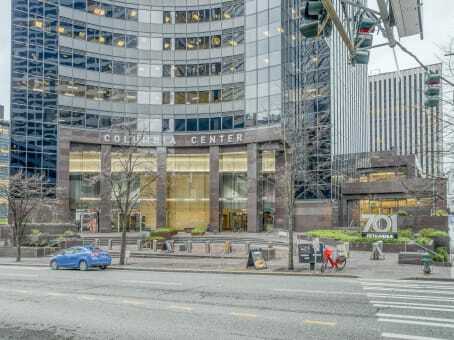 However, the two most fun things to do in Seattle Washington are The Camaraderie Quest high-tech team scavenger hunt and the Build-A-Bike ® program. The team scavenger hunt is very popular around Pike Place Market and other popular locations downtown. 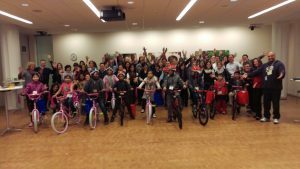 In addition, we conduct the Build-A-Bike ® team event for many of our big customers in Seattle including Microsoft, Boeing, Verizon, and REI. Seattle Washington Team Building Events. A Few Recent Seattle Washington Team Building events. The Bill and Melinda Gates Foundation Build-A-Bike ® team building event boosted morale after a challenging year that saw a lot of change. 70 employees participated in this fun team building activity. They decided to bring in The Leader’s Institute ® and Los Angeles based instructor Chris McNeany to conduct a Build-A-Bike ® team building event. The group came into the event expecting a meeting. However, the event planner surprised them with a team building activity. There was some skepticism at the beginning of the event as to just how fun it would be. However, by the end, everyone was on board and had a fantastic time. A local elementary school identified the kids who would receive the bikes. The students loved the gift. The group agreed it was a great way to end the year. They also liked being able to give back to the community. We held he Bill and Melinda Gates Foundation team building event at 500 5th Ave N, Seattle, WA 98109. The Leader’s Institute ® recently taught a one-hour personality temperament and Build-A-Bike ® team building event in Seattle, Washington. Both events were led by Los Angeles based instructor, Chris McNeany. The personality types workshop is similar to other personality temperament workshops, but more simple and easy to interpret and use. After doing a brief personality types assessment, the instructor then gave a brief description for each personality type. He then gave a quick overview of general strengths and weaknesses for each type in the way they communicate. The group then broke into smaller groups, according to their personality types. The small groups discussed with each other what they felt that their strengths and weaknesses were. The discussion concluded with ways to overcome the weaknesses. They then shared this information with the larger group. All the participants to learned something about their colleagues that they might not have known before. The group then worked together on a Build-A-Bike ® team building activity. The participants completed each bike. Then, our facilitators checked each bike for safety. Some very excited children in need in the Seattle area then came to receive the bikes. The participants were both surprised and moved. A Combination of Personality Temperament and Build-A-Bike ® Gets Great Feedback. “Thank you so much for facilitating a wonderful activity! As I’m sure you can imagine, we got nothing but positive feedback.” — Moss Adams. The combination of both the Personality Temperament Workshop and Build-A-Bike ® workshops fit really well together. With both activities participants get solid team building skill development. The day ended with a charity donation to benefit the local community. Whether you are looking for a fun, high energy activity or solid team development, our instructors can help. We held this event at the Hyatt Olive 8, 1635 8th Ave., Seattle, WA 98101. Perkins Coie, a law firm headquartered in Seattle, WA, hosted a Build-A-Bike ® team building event for its newest group of attorneys. The 30 participants attending just graduated or have less than two years of legal experience. Perkins Coie wanted to introduce them to their culture. Their commitment to community service initiatives is very important to the company. The firm has over 900 lawyers in 19 offices across the United States and Asia. In addition, it just celebrated its 100th year anniversary last year. The firm has a strong legal practice. They also focus on their community as well. In fact, Fortune listed them in the “100 Best Companies to Work For” 10 consecutive years. This commitment brought the organizer’s to Build-A-Bike &reg; for fun and to give back to the community. Some of the attorneys had met one another during their time as summer interns, however, not all were summer interns. Also, they came from a variety of different practice groups. As a result, they don’t interact with one another on a daily basis. The exercises in the Build-A-Bike &reg; were a perfect way to get the participants interacting and partnering to accomplish the tasks. The groups work together to solve team challenges. Each team also must go outside of their team as well. This is just how it is in the firm. It is essential for the associates to know their colleagues from across various offices and practices groups. This way, they can partner with them on future projects. By the end of the event the new attorney’s saw first hand how working together and bridging the gap with other groups is the recipe to success. The Perkins Coie employees’ hard work and determination paid off in the form of 6 new bicycles. The group donated these bicycles to the local Boys and Girls Club of King County. Aside from learning new communication skills, Build-A-Bike &reg; also teaches the value of giving back to the community, which is one of Perkins Coie’s core principles. They grew stronger as a team. They were also able to have fun and make a difference in the lives of 6 lucky boys and girls. The team will certainly carry the lessons learned and the fun memories with as they return to their respective areas. 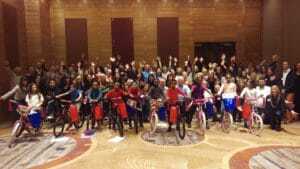 When Trident Seafoods, one of the largest seafood companies in North America based in Seattle, Washington wanted to host an event to bring a close to their annual sales meeting, they decided to participate in a Build-A-Bike ® team building event. Over sixty employees of Trident’s sales department gathered to build a stronger team and improve communication. The group was mainly from the local area with a few people from Canada and Mexico. So, the opportunity to be with each other face to face was that much more beneficial. Trident employees bring the highest level of quality to what they do. It shows in the long success of their company. It is through meetings like this that helps them build a stronger team. They started off earnestly to complete the tasks to build their bikes. The Build-A-Bike ® team building event is not designed to be a competition. However, the Trident participants still thought they had something to win. They ripped through the challenges very quickly then worked on constructing their bikes. As usual, they realized half way through that they wouldn’t be able to complete the bikes without working together. The idea that the teams are separate entities and must operate like that is a common trap. Eventually they came together and helped their opposing teams to complete the challenges. The bikes were built with the same high level of quality that the trident group brings to every thing they do. The event lasted only two hour.,However, the teams came away with valuable lessons about teamwork and working together. Their hard work paid off when they presented ten bikes to kids from the Boys and Girls Club of King County. Seeing the faces of the kids with their new bikes was all they needed to know their hard work was worth it. By the end of the event the participants were wiping their tears of joy away and thanking me profusely. Employees of the consulting firm Jibe gathered in downtown Seattle, Washington to get to know each other better and give back to the community by participating in a Build-A-Bike ® Team Building Event. Jibe is a management and technology consulting firm that specializes in driving business results through process automation. With consultants based in the Pacific Northwest and Rocky Mountain Region some of the participants in the team building event rarely have an opportunity to see each other face to face. The 65 Jibe employees had a few short hours to catch up, have a good time and build some bikes for kids. When the event started, we split the employees into teams. We then gave challenges for each team to solve in order to get everything they needed to build a bicycle. The instructor encouraged them to keep an open mind to new ideas from any source. The employees conquered these challenges and worked together efficiently to improve teamwork and leadership skills. During the course of the team building event the Jibe employees saw firsthand evidence of how better communication and working together as a team, rather than individual departments, helped them to achieve their goals. Jibe has a great group of employees who had lots of fun working through the team building event. They also got to know each other a little bit better in the process. Of course the Build-A-Bike ® wasn’t just about having fun. 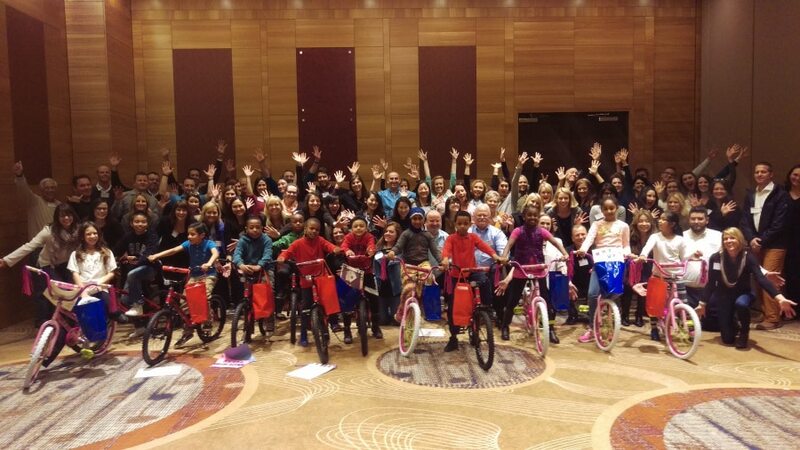 Jibe built and donated 10 bikes to the Boys and Girls Club of King County. At the closing of the event the teams got to award the bikes to 10 lucky boys and girls. Aside from teamwork and leadership skills, the team building activities also teach the value of giving back to the community. The smiles on the faces of the boys and girls with their new bikes was a direct example of one of Jibe’s missions to give back to the community. Employees of Microsoft’s Trustworthy Computing department gathered in Seattle Washington to take a break from their normal routine by participating in a Build-A-Bike ® team building event. The 25 employees were from many different locations. However, most of them were very familiar with each other and comfortable working as a team. They already had a strong teamwork environment. However, they were also open to learning and growing through the event. The departments focus on communication and teamwork benefited them greatly during the events challenges. One of the underlying challenges of the event is to pool together individuals unique talents and strengths to find the most effective solutions. Sometimes teams that are already very comfortable working together find themselves under pressure when they are forced to adapt their talents in a new environment such as assembling a bicycle. While tension got high at some points, they worked diligently together to complete the challenges. This is how the event helps teams grow even stronger and improve communication within the team. Aside from having some fun and learning some new teamwork and leadership skills the Microsoft team was also able to give back to the community through the event. The twenty five employees built four bicycles. They presented these bikes to some lucky kids from the Boys and Girls Club of Seattle. The Build-A-Bike ® team building event gave the Microsoft employees the opportunity to see a direct result from their work and generosity. The kids will certainly remember that day for a long time to come. At the end of their financial year, Microsoft employees gathered in Seattle Washington to let loose and have some fun while giving back to the community by participating in a Build-A-Bike ® team building event. Microsoft hosted the event at their campus headquarters in Redmond, Washington, near Seattle. Despite the fact that it poured down rain through the whole event the Microsoft staff did not let that drown their enthusiasm. Throughout the event the employees were lit up with bright smiles and eager faces. Their teamwork and positivity were absolutely contagious as they worked through the challenges of the event. We divided one hundred Microsoft employees into teams to participate in the challenges of the Build-A-Bike ® team building event. Like many participants in the leadership and teamwork skills training event, the employees at Microsoft were dedicated to ‘winning’. However, one of the lessons of the event is to see how we behave when things do not turn out the way we wanted. It is this sort of challenge that encourages teams to grow together as they readjust their strategy. Again, the staff at Microsoft faced every challenge with a smile and enthusiasm. While their main goal was simply to let off some steam and have fun, Microsoft also wanted to take the opportunity to give back to the community. The teams successfully completed eighteen bikes. They donated these bicycles to the Boys and Girls Club of Bellevue. The presentation of the bikes to the kids is always an emotional part of the Build-A-Bike ® team building event. The employees of Microsoft were beaming as the kids excitedly ran across the field to get their brand new bikes. Seeing directly the joy that comes from their work and generosity always leaves an impact. Even the chaperone from the Boys and Girls Club, Kristi Holmes, was in tears as she thanked the employees for their donation. Seventy Microsoft employees gathered together for a pre-holiday celebration at their headquarters outside of Seattle, Washington to participate in a Build-A-Bike ® Team Building Event. The group is responsible for designing the support for Microsoft Products to their Enterprise Customers. They are all passionate about helping their customers have a good experience with their products. They are are internally driven to work long hours in order to succeed. There were many reasons to come together. Having a fun, relaxing event was high on the top of the list, though. They also wanted to connect with one another on a personal level. Their hopes were through building these bikes and giving them to kids who are without, they would both get to know each other more personally and also feel good about the time spent doing it. Bonding as a group within any company is a challenge with today’s demanding hours and the variety of tasks each employee must tend to in any given day. In addition, the group from Microsoft is a culturally diverse one with many distinct personalities and many different communication styles. As they worked through the challenges, they learned how to rely upon each other to get the work done. They broke down walls that hindered communication. They also found the most efficient ways to complete the challenges. Bringing their employees together for a challenging and exciting event helped them to bond as a company and develop their teamwork and leadership skills. They learned that coming together as a team has everyone winning in the end. They accomplished their goals by building 6 beautiful bikes and donating them to the local Boys and Girls Club of Crossroads.